Boss star shuts down interview before it even begins after getting wind that the network flashes an image of his ex-wife Camille Grammer. 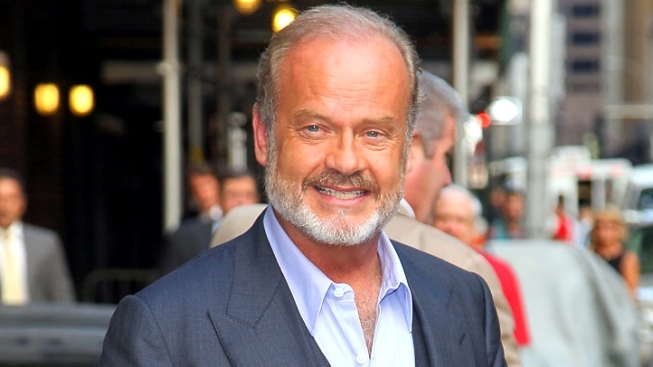 Actor Kelsey Grammer reportedly left the "Piers Morgan Tonight" studio in advance of a scheduled interview with the host. On Wednesday night, Kelsey Grammer reportedly shut down an interview with CNN's Piers Morgan before it even began after the Boss star got wind that an image of ex-wife Camille Grammer had been flashed before the show. At least that's what Morgan says. In a slew of tweets, the talk-show host wrote, "Kelsey Grammer was supposed to be on my show now but ran out of the building. Strange." After getting to the bottom of things, he added, "So, Kelsey Grammer saw a photo of his ex wife Camille in the open to our show and legged it. Extraordinary. Never had this happen before." Still, Grammer's abrupt exit seems to have left Morgan pretty stumped: "I had a very friendly chat with Kelsey backstage," he tweeted. "He said he was really looking forward to the interview. Weird...I like Kelsey Grammer personally, but this was a shockingly unprofessional thing to do. I wasn't even going to mention his ex-wife!" Grammer, on the other hand, begs to differ. In a statement to The Hollywood Reporter, the actor's rep took the talk-show host to task, saying, "Piers needs to take responsibility for what he did to Kelsey. It's called accountability." The actor now joins Morgan's sizable enemy list, which already includes biggies like "mad drunken aunt" Madonna and "vile little creature" Kate Moss. At least Morgan seems to have eked out a few laughs from the brouhaha. Shortly afterward, the host's famous frenemy Simon Cowell tweeted, "@piersmorgan I know how [Grammer] feels," to which the zippy host replied, "I suspect Kelsey was watching X Factor in the green room and suddenly felt nauseous."